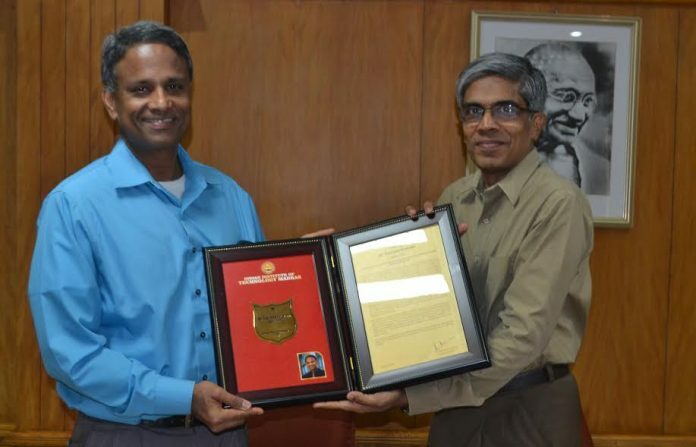 Chennai: Ramayya Krishnan, Dean of the H. John Heinz III College of Information Systems and Public Policy, and William W. and Ruth F. Cooper Professor of Management Science and Information Systems at Carnegie Mellon University, is a 2017 recipient of the Indian Institute of Technology Madras (IIT Madras) Distinguished Alumnus Award. Krishnan received the award on March 16th in a ceremony held at the IIT Madras campus. “Prof. Ramayya Krishnan joins an illustrious group of Distinguished Alumni of IIT Madras who are academicians. Prof. Krishnan is renowned for his seminal contributions to the field of Information Systems, and has made his alma mater proud with his accomplishments as Dean of the College for Information Systems at CMU,” said Professor Bhaskar Ramamurthi, Director of IIT Madras. The Distinguished Alumnus Awards are presented annually by the Institute. Since the inception of the awards in 1996, 147 alumni have been selected for the award. Krishnan received his bachelor’s degree in Mechanical Engineering from IIT Madras in 1981, and both his master’s degree and Ph.D. from the University of Texas, Austin in 1983 and 1987, respectively. Krishnan has been a member of the Heinz College faculty since 1988 and is a founding faculty member of the Master of Information Systems Management Program. He also oversaw the creation of the School of Information Systems and Management at Heinz College, complementing the existing School of Public Policy and Management. He was appointed as the first Dean when the Heinz College was created in 2008 and was reappointed Dean upon the completion of his first term in 2014. In 2016, under Krishnan’s leadership, INFORMS, the global Operations Research and Management Science (OR/MS) Society, recognized Heinz College with the UPS George D. Smith Prize for educational excellence in Analytics. Heinz College is the only academic institution that is home to both the Von Neumann Theory Prize and the UPS George D. Smith Prize. Since he joined CMU in 1988, Krishnan has compiled an outstanding research record in Operations Research and Management Science (OR/MS) and its applications to Information Systems. His contributions have been recognized by INFORMS through its highly-selective INFORMS fellow award, and in 2015, he was conferred with the Y. Nayudamma Award for his contributions to information technology and telecommunications management. He has been the President of INFORMS Computing Society and INFORMS Information Systems Society, and has edited premier journals in the fields of Operations Research, Management Science, and Information Science Research. Krishnan has a worldwide reputation for his expertise in data science and analytics. He has spoken on data analytics at the World Economic Forum, served as a STEM expert on the U.S. State Department Delegation led by Sec. Clinton to APEC (Asia Pacific Economic Consortium), and briefed the ICT Ministers of ASEAN on big data technology and policy. He is a former member of the Global Agenda Council on Data Driven Development at the World Economic Forum. Currently, he serves on the IT and Services Advisory Board chaired by Governor Tom Wolf of the Commonwealth of Pennsylvania.